Mujitsu and Tairaku's Shakuhachi BBQ / Tairaku "worships" the Tooth! » Tairaku "worships" the Tooth! I never really got the whole "hollyness" thing. (Sp: Holyness?) I had always thought that the idea of something or somone as 'holy' to be a bit anti-thetical to the core message of the Buddha. 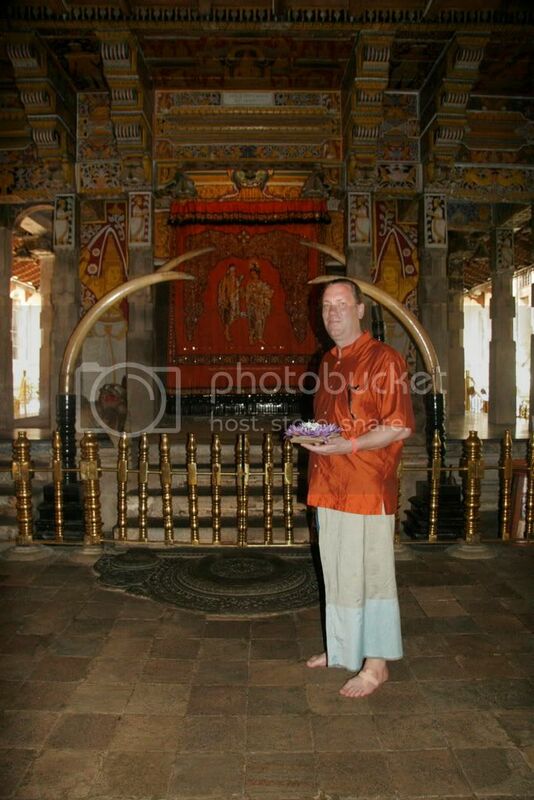 And if you think the Lama is bad on this regard I am sure you must be a bit saddened when you see people in Sri Lanka worshipping the Buddha's tooth. Hey Seth, here are some pics of me doing that last week. 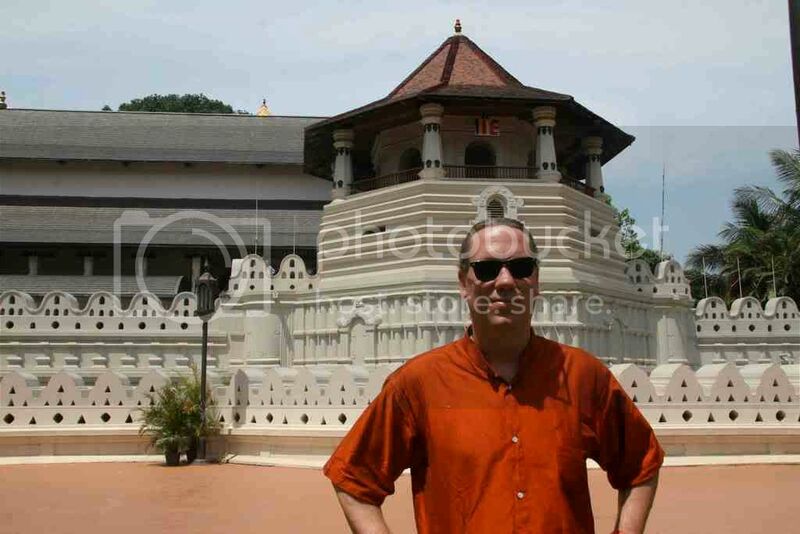 Approaching the temple (with my niece), standing outside the reliquary and "worshipping". They don't use the term "worshipping" they usually say "venerating". Re: Tairaku "worships" the Tooth! The beauty in all this for me is not the tooth itslef. It is the sincerity and respect that the people have for the teachings of the Buddha and congregate in peace in this place. Sri Lankans do rituals such as lighting incense in front of their home Buddha statue, almsgiving, outings to a temple, abstaining from meat for a period, as a way to get out of the daily grind and focus upon Buddhism. Thank you for these photos. They bring back great memories of when I was there about two years ago. And respect for the dhoti! I never had the nerve to wear one in public. Do you attach it with a safety pin or did you go fully native? 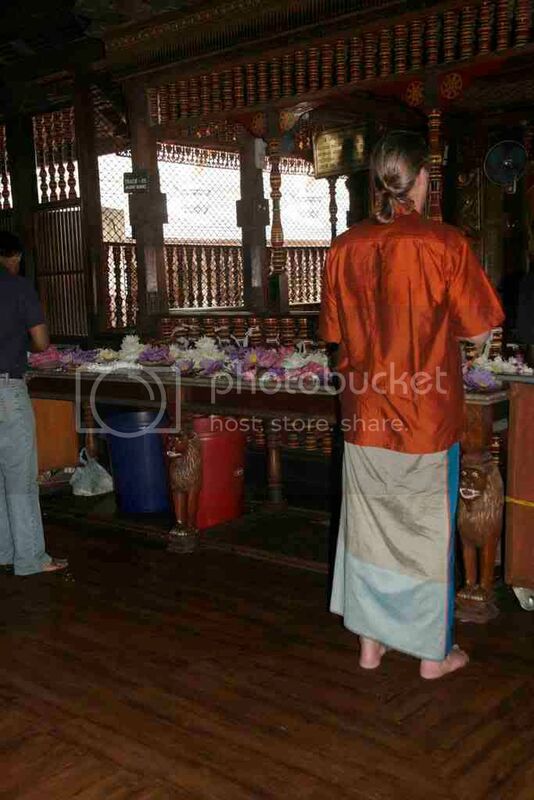 There is a belt with a built in wallet that goes with the sarong suit and holds the sarong together, so I use that. It paid off on this day, they waived the "foreigner" admission because I was dressed properly. Not everybody likes it however. One of the forum members (who shall remain anonymous) sent me a skype message saying "Shirt is nice but I'd skip the skirt." I asked him, "Don't Albanian men wear dresses?" OK Seth, you were speculating about me becoming the Pope and a few days later I materialized at St. Peter's. Then talking about the Temple of the Tooth and weeks later I am there. Do you see a pattern? Maybe you should start daydreaming about "wouldn't it be cool for a shakuhachi player to go on the space shuttle?" or "I wonder what it would be like to blow the flute at Easter Island" and other pleasant thoughts.